SUPing or Stand Up Paddle Boarding is the newest water sport that everyone is talking about! Stand-up paddle surfing is hitting NZ waters right now. It is the perfect escape from a hectic lifestyle, whether you’re cruising lakes and estuaries, sightseeing on the harbour, downwind ocean paddling, or out in the surf, catching more waves than you can imagine. And without even thinking about it you are turning into the ultimate fitness machine – strengthening your core, toning muscles, fat-burning and enjoying life more than ever. the SUP industry leader…it has the best designs…the best construction…and best value… to try before you buy contact Kitescool on 021354837. All models and accesories are available at Kitescool! Stand up paddle surfing (SUP), or in the Hawaiian language Hoe he’e nalu, is an emerging global sport with a Hawaiian heritage. It can be traced back to the early days of Polynesia. The sport is an ancient form of surfing, and began as a way for surfing instructors to manage their large groups of learner surfers, as standing on the board gave them a higher viewpoint, increasing visibility of what was going on around them – such as incoming swell. To begin with, this started with using a one-bladed paddle, whilst standing on a normal length surfboard. 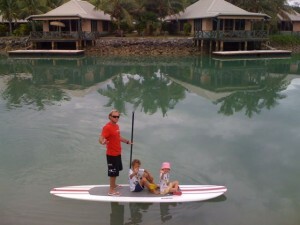 The popularity of the modern sport of SUP has its origination in the Hawaiian Islands. In the early 1960s, the Beach Boys of Waikiki would stand on their long boards, and paddle out with outrigger paddles to take pictures of the tourists learning to surf. This is where the term “Beach Boy Surfing”, another name for Stand Up Paddle Surfing, originates. Kitesurfing Gift Vouchers… the ultimate Christmas or Birthday Gift! Ph Warren or Wiebke on 021354837 to order your gift voucher. SUPing or Stand Up Paddle boarding is the newest water sport that everyone is talking about. Perfect for flat calm no wind days, surf, lakes and rivers and anyone can do it… available at Kitescool ph 021354837.
i fully endorse their kite surfing school and teaching techniques. Cindy Mosey former World Champion Kitesurfer 2005, 2006 and 2007.